The Lakshmi Narasimha statue is one of the most imposing sculptures found in the ruined town of Hampi. The speciality of the sculpture is that it is the largest monolith statue in Hampi. The statue is located on the southern side of the Hemakuta group of temples that stand on the Hemakuta Hill. This gigantic stone structure is considered to be among the most important monuments found in Hampi. It is a major tourist attraction and is visited by a large number of people throughout the year. The Lakshmi Narasimha statue and the temple housing the statue were built in the year 1528 A.D. It was constructed during the rule of Krishnadevaraya, one of the greatest rulers of the Vijayanagara Empire. The temple is dedicated to Lord Narasimha, one of the ten avatars of Lord Vishnu, and Goddess Lakshmi. As such, the temple is known as the Lakshmi Narasimha Temple. The original sculpture had a small figure of Goddess Lakshmi, consort of Narasimha, sitting on his lap. The gigantic statue was vandalized and mutilated in 1565 A.D. during the raid by the Mughals that led to the fall of the Vijayanagara Empire. 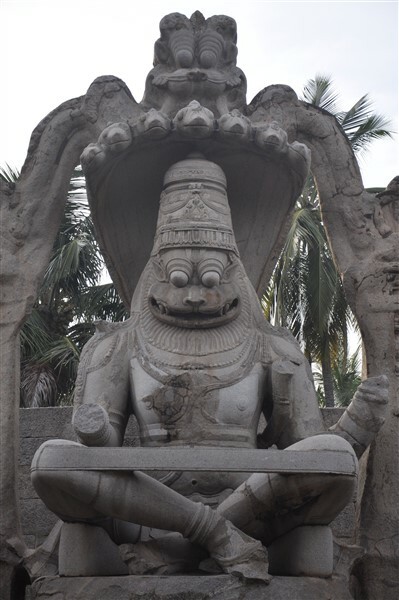 The limbs of Narasimha’s statue were broken during the attack. The figure of Lakshmi was separated from that of Narasimha. In the process of destruction, one of the hands of Goddess Lakshmi was broken and even today the broken hand of the Goddess can be seen resting on the back of Narasimha. Now the damaged statue of Lakshmi resides at the Archaeological Museum at Kamalapura. The Lakshmi Narasimha statue at Hampi is a brilliant work of architecture. It is a rare statue with a huge size and was crafted with great details. The statue has a height of 6.7 metres. It is one of the finest existing samples of the Vijayanagara style of architecture. The statue of Narasimha has a finely chiselled broad chest and a well-defined mane. Narasimha is adorned with a beautiful headgear and is seen seated in a cross-legged position. The sculpture portrays Narasimha sitting on the coils of Adishesha, the king of all snakes, which rises behind him with its seven hoods. The hoods have been beautifully designed to serve as a canopy over Narasimha’s head. The sculpture is set within a Makara torana or arch. There is a lion-mask set above the hoods of Adishesha. All these features make the statue an interesting piece of architecture. The most unique feature of the statue is the bulging eyes of Narasimha. The large round protruding eyes provides the statue with an exceptional look. Though the statue of Lakshmi is no longer sitting on the lap of Narasimha, one can imagine the beauty of the complete statue in its original undamaged form. It is really amazing to note that such a huge sculpture was crafted from a single boulder of granite. The sculpture displays the expertise of the craftsmen of that ancient era. According to Hindu mythology, Narasimha is the fourth incarnation of Vishnu and appeared on earth in the form of half human (nara) and half lion (simha). Narasimha is believed to have the face and claws of a lion, and torso and lower body of a human. As such, the huge statue in the Lakshmi Narasimha temple of Hampi has the face of a lion and the body of a human. The mane and the wide jaw of Narasimha clearly express the features of a lion. There are two theories about the form of Narasimha portrayed through the statue. One theory suggests that the statue represents the Ugra Narasimha (fierce Narasimha) form. The reason stated is that the statue has a fierce appearance, expressed through the protruding eyes and the scary facial expression. The absence of Goddess Lakshmi beside the God also added to the relevance of this theory. The other theory suggests that the statue represents the Malola Narasimha form. The reason stated is that in this statue Narasimha is seen with his consort Goddess Lakshmi sitting on his lap (though the figure is now damaged). Malola is a combination of two words – Ma meaning Goddess Lakshmi and Lola meaning beloved. Regardless of whatever form of Narasimha the statue represents, it is without doubt a reflection of the rich artistic heritage of the Vijayanagara Empire. Hampi is a world famous tourist destination that draws visitors from far and near. There are several ways to reach Hampi from various towns and cities of Karnataka and beyond. The location of Lakshmi Narasimha statue, based on the southern side of the Hemakuta group of temples, is a well-known spot in Hampi and is easily accessible from all parts of the ruined town. Hampi is an ancient village with no airport of its own. Ballari (Bellary) is the closest town that has an airport. Ballary stands at a distance of around 64 km from Hampi. Visitors can take a flight to Ballari and then reach Hampi by means of local transport. Hampi is a place that is devoid of a railway station. The nearest railway station is situated in the city of Hosapete (Hospet). It has the Hospet Junction Railway Station. Hosapete is at a distance of around 10 km from Hampi. One of the simple ways to reach Hampi from Hosapete is to travel through a bus. Other means of local transport are also available for visitors to reach Hampi from Hosapete. Hampi has a strong road network and is connected to a number of towns and cities by means of this network. There are a lot of buses that travel between Hampi and several other towns and cities in Karnataka.